Global football tournament to inspire homeless people to change their lives. This year in George Square, Glasgow, 10-16 July. Today, more than 500 men and women from across the world have arrived in Glasgow for the 2016 Homeless World Cup, each with their own unique story to tell as part of their journey to create a better life for themselves. And that is exactly what makes the Homeless World Cup so powerful. Sport changes lives. We know that from experience in Glasgow. It inspires and connects with people on so many levels and the Homeless World Cup is a shining example of that. It raises awareness of the challenges faced by many people in communities across the world but more than that, it shows what can be achieved by working together. Football is a universal language. It knows no barriers. It doesn't take into account race, gender, sexuality or for that matter whether a person has a home or not. So with that in mind the Homeless World Cup will use the power of football as a means of promoting anti-discrimination. It is a simple concept but so effective. And it will be life changing for those who take to the pitches in George Square. Glasgow, like every other major city in the world, has had its share of experiences of homelessness. It is a heartbreaking to think that in today's day and age there are still people who are homeless. There are many different reasons why this is the case and as a city we will continue to do all we can to help the most vulnerable people in our communities. We will never shy away from that. We have made great strides in Glasgow in terms of providing good quality affordable housing and but we know more must be done. The Homeless World Cup will play an important role in this by helping us change public perceptions of homelessness. By hosting the event right in the heart of the city in the iconic George Square we are showing just how serious we are about tackling social exclusion. I have been involved in numerous sporting events over the years. And in different ways they have all made a positive contribution to the lives of many people. But few events will touch the lives of more people than the Homeless World Cup. It is truly a life changing event for the participants and I can't wait for the action to get underway. The Homeless World Cup Foundation - led by Mel Young - has an unwavering commitment to fighting homelessness and deserves enormous credit for the work it does on a daily basis. For the Foundation the Homeless World Cup it is about much more than seven days of football - it works tirelessly to improve the lives of people across the world 365 days a year. 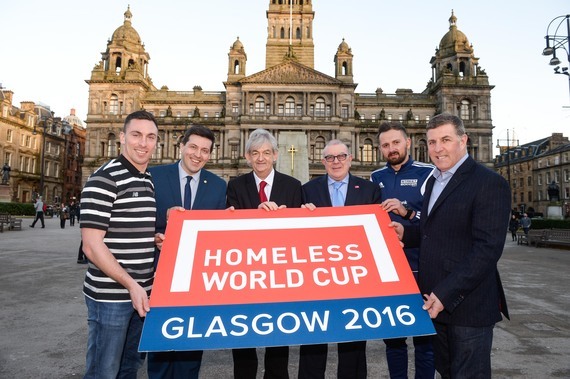 The Homeless World Cup takes place during the most successful period in Glasgow's sporting history, with the city having hosted some of the world's most prestigious events in recent years. But our approach to hosting major events is about much more than world-class sporting completion. It is about creating and leaving a lasting legacy for future generations. And while the focus will be on football over the course of the event, there is much more to the project in that regard. Thanks to a partnership between Glasgow Life and the Big Lottery, around 150 volunteers have been recruited for a variety of roles on and off the pitch. The legacy project will give the volunteers, who have all experienced homelessness, new skills and confidence though a program of sports coaching, and creative writing. So while the football will last for seven days the positive impact of the event will last for months and years to come. That is what we mean when we talk about legacy.